General Outlook: Similar weather will prevail on Friday and Friday night. Tonight E-SE 10-20 kts Light Chop-Choppy 3-5 ft ISOLATED SHOWERS. An upper level low centered near Jamaica, middle level diffluence along with shallow moisture in the NW Caribbean support scattered showers and tstms N of 17N between 73W and 81W. In the SW basin, the monsoon trough supports isolated showers and tstms S of 11N. 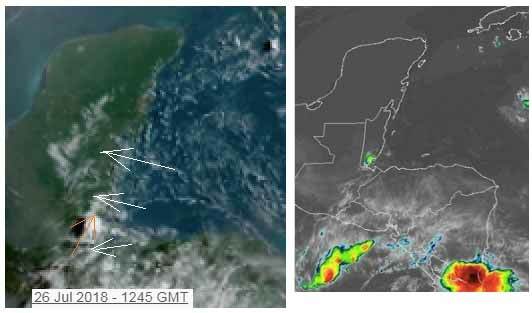 GOES-16 water vapor imagery show very dry conditions across the remainder of the basin while an enhanced RGB show a thin layer of Saharan Air Dust moving across the area. Strong deep layer wind shear is also noted in the E Caribbean. These hostile factors are suppressing convection elsewhere. Otherwise, a tropical wave moves over central Caribbean waters. See the waves section above for further details. A new tropical wave is forecast to move across the Lesser Antilles Friday night. 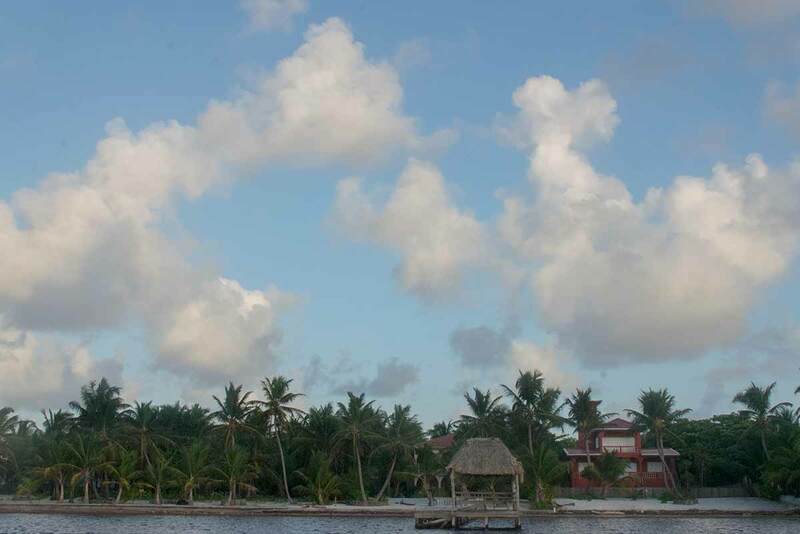 On Ambergris Caye this morning we have another beautiful day with the breeze from the South-SE at 6 mph. and a calm sea around our barrier reef. 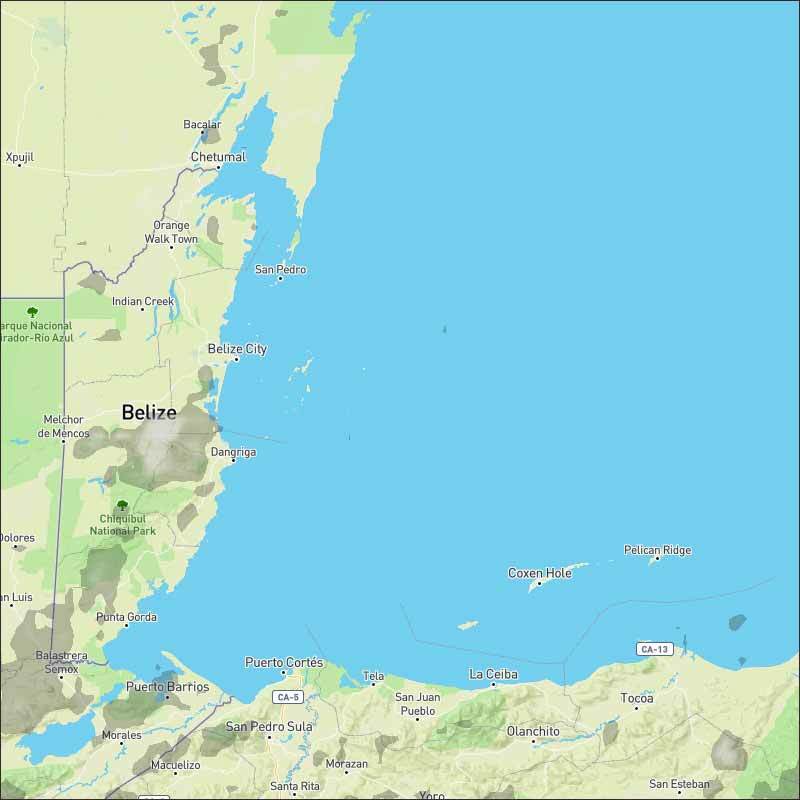 The expected high today is 88 f.
Tufts of white Caribbean clouds already streaming in over much of Belize and will be replacing the fog shortly. There is a small, but very significant swellup over Toledo right now, caused by high level winds from the south and heavier easterly Caribbean clouds, but relatively little rain, some approaching PG. Looks like today will be mainly sunny, but with, perhaps more cloud than yesterday, small chance of some rain.